The familiar and the uncommon blend together to form the dolorous heart of this release. With contributions from a number of artists, The Sevens Collective brings an album of music that brings to mind everything from Spanish guitar ballads to avant-garde chamber music to dark ambience and improvised space-rock jams. Vocals glide between spoken word and doleful singing, as slow evolution and quick changes are woven around common threads of piano, violin, and guitar, revealing then secreting away drones, electronic ambience, and Tuvan throat singing. 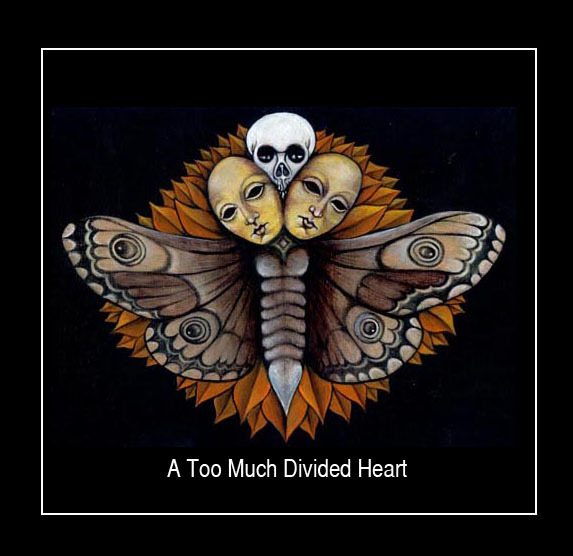 At times serene, sad, disturbing, and alien, “A Too Much Divided Heart” brings 8 tracks that blend traditional song structures and instrumentation with experimental concepts and electronic sounds in ways that occasionally evoke memories of lost love and dreams of alternate universes. Echoes of Current 93, Coil, and Nurse With Wound may be heard within. Jennifer Hames – Violin, Piano. Paul J. Rogers – Electric & Acoustic Guitars, Sound Sculpture, Synthesizer, Voices, Percussion, The Berlin Tapes, Broken Zither.